Say goodbye to shifter slop; introducing the Boomba Racing Shifter Assembly Bracket for the S550 Mustang. If you have a 2015 + Mustang with the MT82 transmission, you have probably noticed some weird things going on like clunking, excessive movement, and possibly even missed gears. This is due to the sloppiness of the stock shifter assembly bracket. The Boomba Racing Shifter Assembly Bracket completely replaces the OE unit and provides you with an all-round improved shifting experience. You will immediately notice a drastic increase in positive and precise shift engagement. This bracket will allow you to confidently rip through the gears in your Mustang without the worry of a miss-shift. 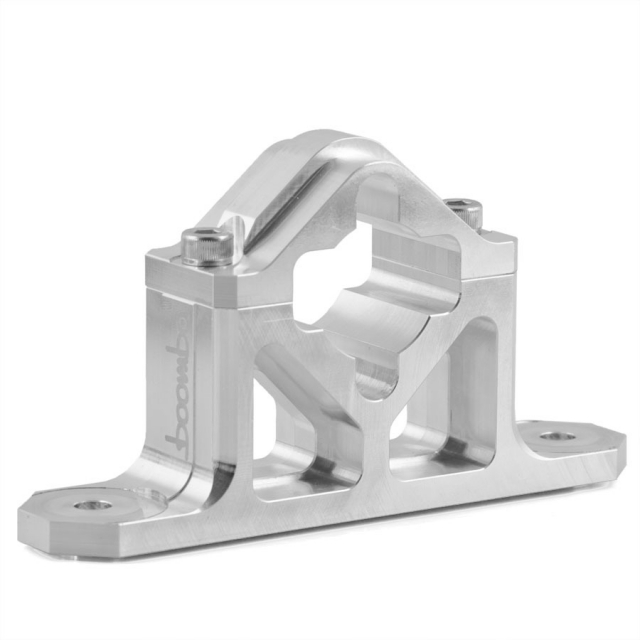 This bracket is made from aircraft grade billet aluminum and utilizes absorption bushings to minimize NVH. This piece is available in your choice of four different colors: natural finish, blue, red, or black anodized.